The Friday File: 75% of Mississippians pray daily, tops in the US; just 31% of Vermonters do, the smallest percentage. 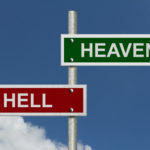 As for believing in Hell, top spot at 77% is held by residents of Mississippi and Tennessee; just 36% of those in Massachusetts do, the lowest rate. As for Heaven, Mississippi is again first with 88% believing; Massachusetts is again last at 54%. Unsurprisingly, belief in Heaven tops Hell!